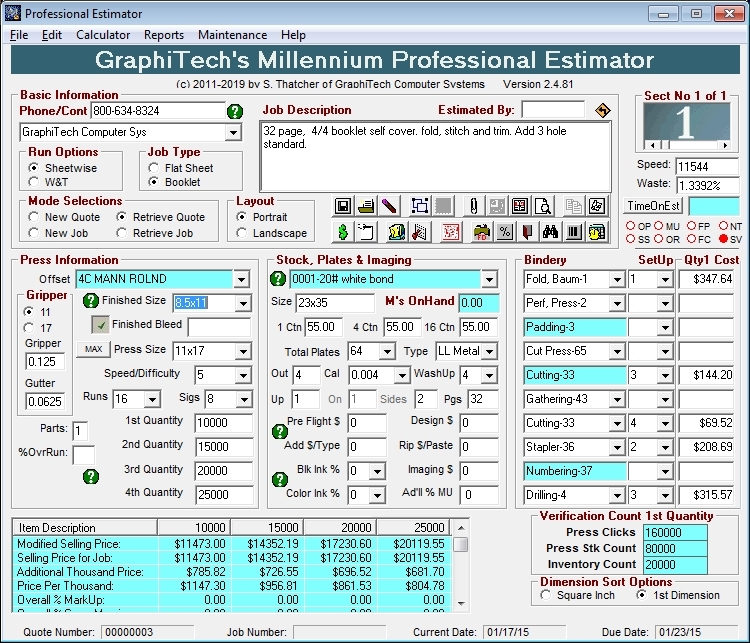 GraphiTech's Professional Estimator is purchased on a Modular basis starting at only $1000. By adding only those modules needed, the cost of this remarkable program can be kept to an absolute minimum. NOTE: All transactions are provided through PayPal which is a secure site. Basic Only $1,000. See Below. The Basic program includes the following Features: (1) Pre-Press Imaging & Ripping Calculators. (2) Full Ink Coverage Table. 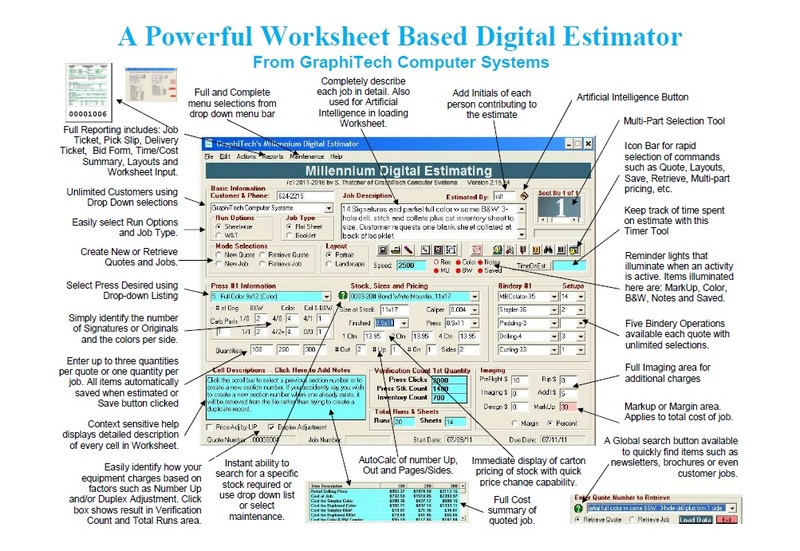 (3) Complete Documentation & Sample Estimates. (4) Unlimited Presses. (5) Artificial Intelligence Loads Worksheet from Job Description. 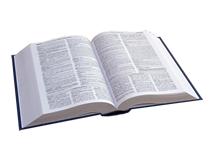 Automatically senses and converts basic pre-defined descriptive words in order to fill out items such as Runs, Signatures, Plates, Sides and/or pages. 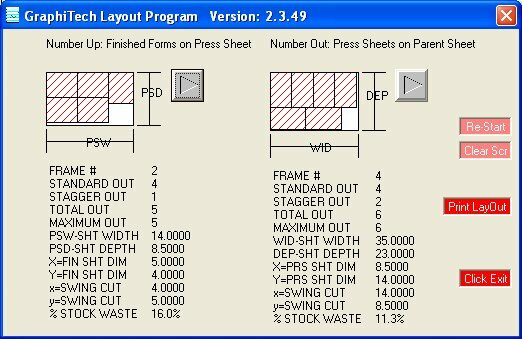 (6) AutoCalculate Up, Out, Pages, Plates, Sheets, and Runs. (7) Four Quantities quoted simultaneously. (8) Context Sensitive Help for all Data Entry areas. (9) Unlimited Production Notes. (10) Instant retrieval of Quotes and/or Jobs. (11) On Screen display of all costs and times. (12) AutoCalc by entering Pages desired will determines Sigs, Runs, Plates, Sides and Pages. (13) Easily handles Full Color, B&W and Blank Sheets using same part number. (14) Quantity of Stock Available always showing for each Quote or Job. Automatically depletes inventory when Work Order created (Enhanced with Stock Option Below). (15) Areas available for entering costs of Ripping, Imaging, Pre-Flight, Design and Additional Costs. (16) A Full Six Departmental Markups. (17) Additional Profit added with Markup. (18) Save Quote or Job Automatically while pricing. (19) Easily Retrieve Quote or Job for Modification and or new Quote or Job. (20) Change Stock Price on-the-fly. (21) Global Search for specific items within a Saved Quote/Job. Items such as Customer, Job Number, Stock, Description, etc. (22) Global Search for any type of Stock such as 3 part, 60#, offset, etc. 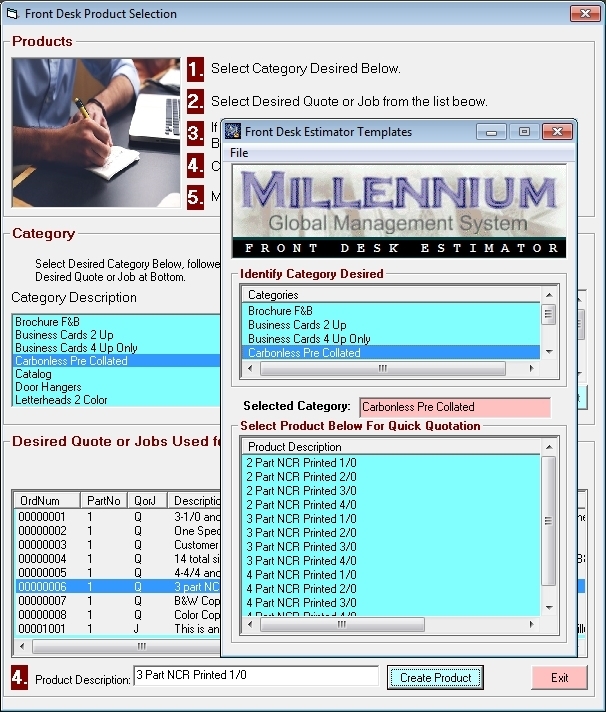 (23) Easily add Customers through Maintenance with ability to delete and/or edit. (24) Instant lookup of both Company & Contact Phones, Emails & more. (25) On Screen Quick Review of Press Sheet Layout. (26) Complete selection of Outside Services. 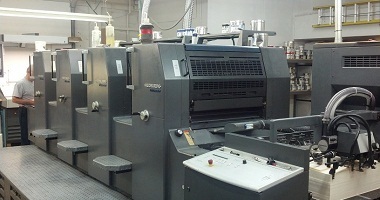 (27) Quick Loading of Max Press Size into Press Sheet. (28) Generic Stock added that allows user to enter any size into Press Sheet without having any stock available. (29) Easily moify Stock Pricing on-the-fly. (30) Easily specify a percentage of Run in Bindery, from 10%-199%. (31) Easily specify Sheet Size to be usd in Bindery. (32) Add additional Runs in Bindery - Useful for items that require double runs but n aditional setup. (33) Bindery Notes available even if Option not Selected. (34) Easily set up Default Values for Worksheet, Imaging and Bindery. (35) Automatically determine Due date by Specifying Days Required in Pre-Press, Press, Bindery and Delivery. (36) Multi-Part Pricing Table. (37) Gripper and Gutter specs for Bleed. (38) Detailed Signature Entry Table. Add Basic Professional Estimator ($1,000) before Adding Options Below. 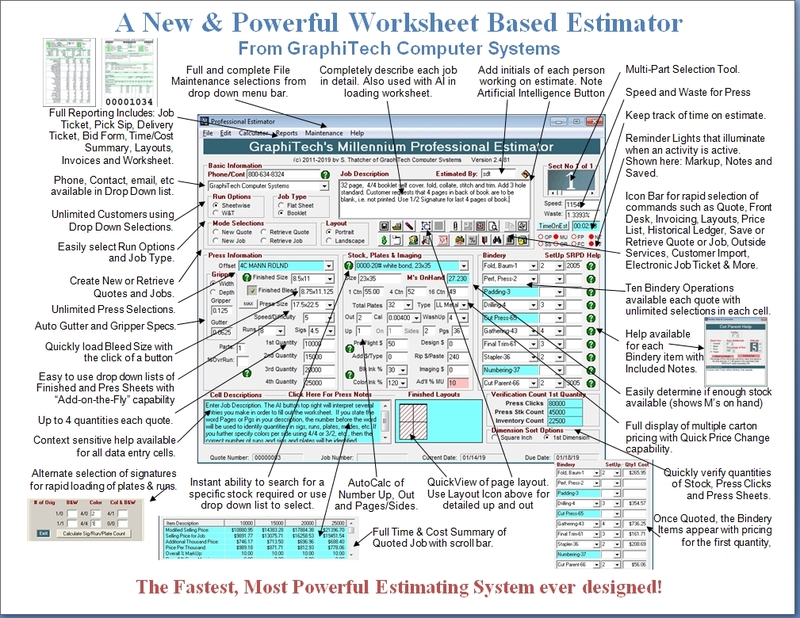 The Basic Professional Estimator is capable of an incredible amount of Optional versatility. There are over 75 possible combinations of Optional Add-Ons available. The following selections (drop down list below) represent the most common options. After adding the Basic Professional Estimator to your cart, simply select the options desired below and add to your cart as well. However you may also choose to add them individually after your purchase of the Basic Professional Estimator above. Note that prior to obtaining your license for the Basic Version above, all options shown below (excluding the premium options shown), are included for review purposes. Even after you purchase your Basic program, you may add options at any time. Descriptions of the available Options are shown below. The last purchase option allows you to simply select the number of $240 options you desire and add that to your cart as many times as necessary. When calling for your unlock code, the options you desire will appear when we get your Key Code. $240 - Full Bindery. Full Selections plus Edit and Create capability. Help Screen provides enhanced Data Entry by allowing Additional Runs, Percentage of Runs, Finished, Press and Parent sheet Sizes and Difficulty. $240 - Stock Inventory. Edit/Copy/Delete. Up to 3 Carton Pricing. Includes Price On-The-Fly and shows both MTD and YTD Usage History. $240 - Reports Package. Includes Work Order/Pick Slip, Job Ticket, Quote Form, Delivery Ticket, Worksheet, Time & Cost Summary, Layouts, Worksheet. Additional Reports to include Current Inventory, Inventory Usage History, Expanded Delivery Ticket, Detailed Single-Part Bid, and Purchase Order. $240 - Multi-Part Estimates. Up to nine different parts may be created for a single quote. 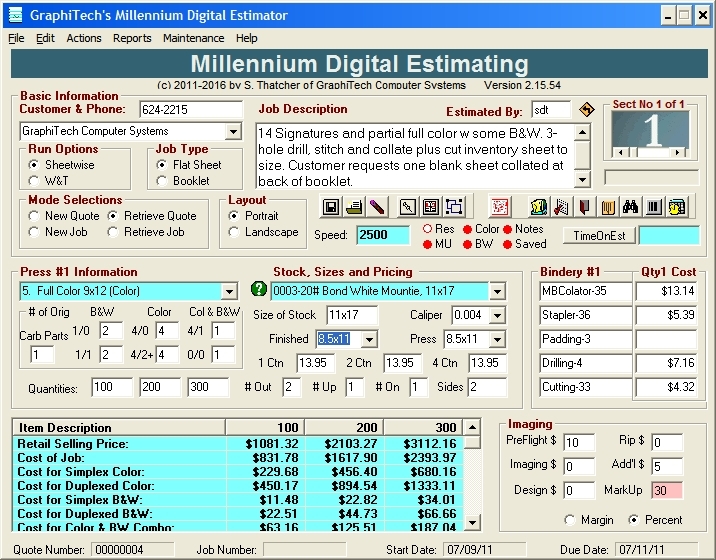 In addition, options such as Delivery Ticket, Invoice and Quotes display all parts of the quote/job. $700 - Network Enabled. This option opens up the program for unlimited use on as many computers as desired using a common central data location. $240 - Customer Import from QuickBooks. 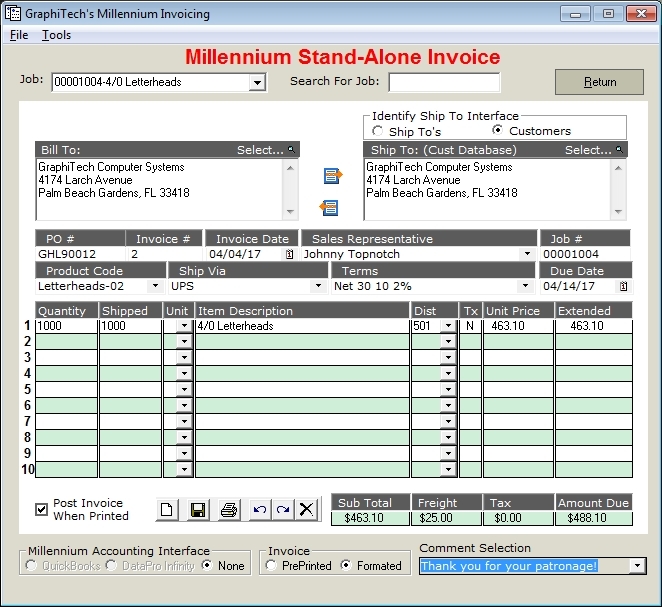 For those companies tat have QuickBooks, you can simply export your Customer file to any location in the network and then Import to GraphiTech automatically. Each Import will overwrite any existing Customer with the new data from QuickBooks except Contact Information will not be Overwriten. $240 - Electronic Job Ticket. 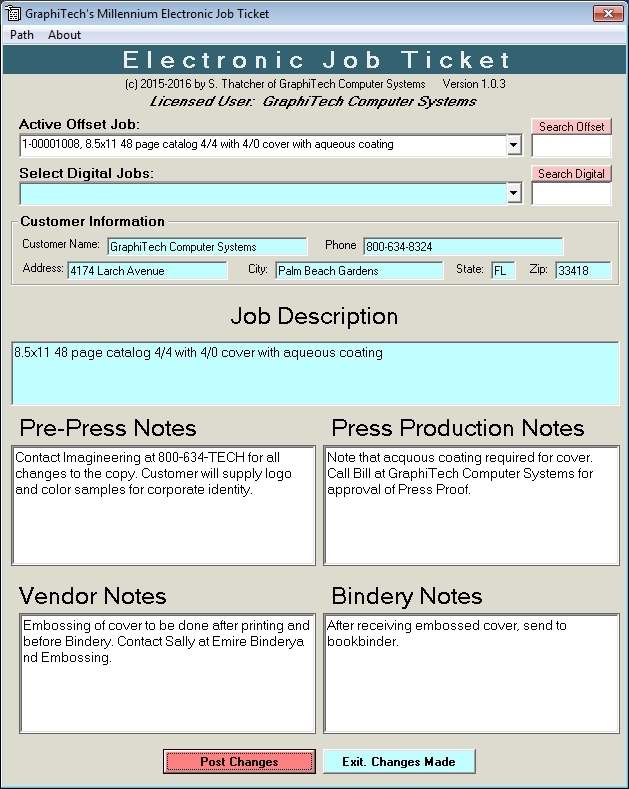 The Electronic Job Ticket Provides Notes for Bindery, Vendor, Press and Pre-Press. 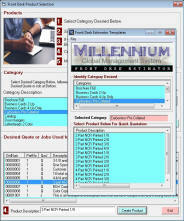 Allows Production Personnel to have full and complete information on current status of each department for that job. All updates only occur at Estimate Level. $240 - Invoicing & Historical Ledger. Retrieves Job and populates invoice. Printing Invoice then populates Historical Ledger along with archiving data in Job Log (helpful if using Job Tracking or Job Costing). Ideal for creating a quick invoice that travels with the job up to and including Accounting. Currently does not populate QuickBooks (See QuickBooks Interface below), but this will be modified in subsequent updates. The Historical Ledger Allows user access to every customer's job that had been invoiced along with both Job Number and Invoice Number. Great for looking up specific Job for repeat orders. Also included is Top Customer Report on Sales Volume within any given date range. $240 - Price List Generator. 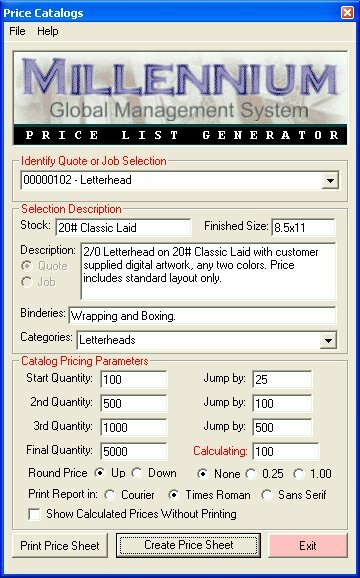 Quickly create Price Catalogs for common jobs. Post on Web or keep at the counter for customer look up. $240 - Front Desk Estimator. Popular among counter help. Create a Category such as Newsletters followed by any number of products such as 4 page 11x17 Enamel, 8 page 11x17 enamel, etc. Then any time a customer requests a newsletter, simply click on the Category followed by one of the Products and the Worksheet is completely populated with all the required information. Enter the Customer and Quantity desired and click the Quote Button. It's that simple. Also permits full access to entire quote, as required for changes. The Professional Estimator is not just a complex and powerful estimating platform but a total Management Information System as well. $475 - Job Tracking. Every Job created is posted to a Job Log. Job Tracking software allows employees to log into Job with or without Bar Codes for instant location of Job and CSR Early Morning Report of Job Status. $475 - Scheduling. 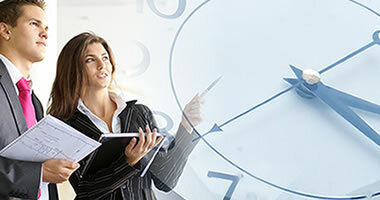 Press Scheduler automatically reviews time available on presses used for job and determines projected due dates and overtime requirements if required. 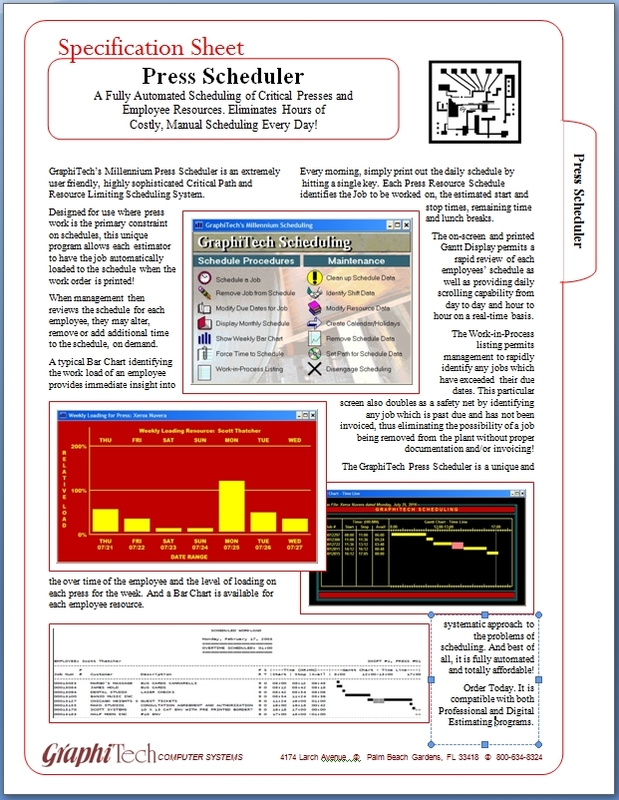 Includes both Gantt Time Line charts as well as weekly loading of resource. $800 - QuickBooks Interface. Prints Invoice in both a pre-printed or formatted edition (same as $240 option above). But this option Easily transfers invoice information (Accounts Receivable, Sales Tax Payable, Freight plus all Revenue Items) to QuickBooks while populating Historical Ledger. Quickly import Customers from QuickBooks. Also contains an Import Viewer and Ledger QuickBuild. Saves hundreds of hours every month. Please note that Populating Quickbooks will be an enhancement to the Invoice Option at the $240 price level in future updates. $275 - Budgeted Hourly Cost Analysis. Easily and quickly determine your actual hourly rates for any piece of equipment in your plant. This incredible program makes quick work of determining the hourly cost based on various efficiency levels. $2500 - TermSys Shop Floor Data Collection. For enhanced Data Collection that permits reporting of Job Cost as well as Tracking of Jobs, TermSys may be used in lieu of Job Tracking above. This system utilies multiple terminals throughout the plant permitting both Data Collection but Delivery and/or Electronic Job Ticket Viewing as well. $2000 - Enhanced Report Program. Shows Job Location, Detailed Job Cost information, Production and Employee Efficiency plus much more.